Smartphones have revolutionized the way we do a lot of things. Over the years, they’ve replaced gadgets such as tape recorder, music system, calendar, calculator, alarm clock, camera, and even a QR Code scanner! There’s one more thing that smartphones seem to be replacing soon—cash payments. Many countries such as India, China, and even the United States have introduced a cashless payment system using QR Codes. In India, apps such as Paytm, BHIM, and Google Tez allow users to make payments by simply scanning a QR Code. China’s love for QR Codes is well known. Apps like WeChat and Alipay extensively use QR Codes to allow users to make payments. On the other hand, American retail giants such as Target and Walmart have a QR Code system in place for their customers. Recently, another Asian country, Malaysia, has joined the list of countries promoting a cashless payment system. 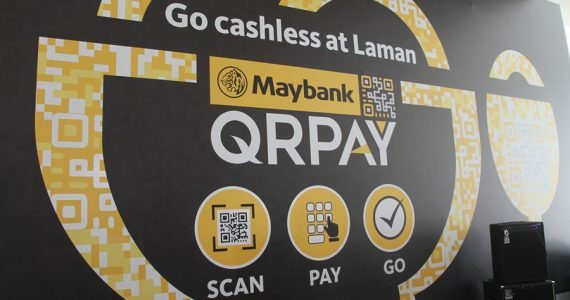 Maybank, a Malaysian bank, has launched a pilot project called “Maybank QRPay”. The app is a cashless mobile payment system that uses QR Codes. Using Maybank QRPay, consumers can make payments for the products they have purchased by scanning the Maybank QR Code using their Maybank2u app. “Our new service is versatile in that it will allow any merchant to accept QRPay transactions from Maybank customers regardless whether its account is with Maybank or not.” –Datuk Lim Hong Tat, Financial Services Head, Maybank Group Community. Maybank QRPay is a bank-to-bank transfer app. The app links to users’ current or savings account. Each merchant will be given a unique Maybank QRPay QR Code. When consumers scan this QR Code using the Maybank2u app, the amount is debited from the consumer’s bank account and credited to the merchant’s bank account. Using the app, consumers can make payments ranging between RM0.01 and RM1,000 daily. For any payment crossing RM 250, the consumer will have to give a proof of identification. This could be a touchID, faceID, or a password. The app is set to be launched for public use from January 2018. What are your views on the Maybank QRPay app? Share your thoughts in the comments section below.